HHS officials will tour three bases in Texas to see if they are suitable to house unaccompanied migrant children, who now number more than 11,000. WASHINGTON — Border agents and child welfare workers are running out of space to shelter children who have been separated from their parents at the U.S. border as part of the Trump administration's new "zero tolerance" policy, according to two U.S. officials and a document obtained by NBC News. As of Sunday, nearly 300 of the 550 children currently in custody at U.S. border stations had spent more than 72 hours there, the time limit for immigrants of any age to be held in the government's temporary facilities. Almost half of those 300 children are younger than 12, according to the document, meaning they are classified by the Department of Homeland Security as "tender age children." The stations, run by the Border Patrol and meant only as the first stop for children detained at the border, often lack adequate bedding or separate sleeping rooms for children. 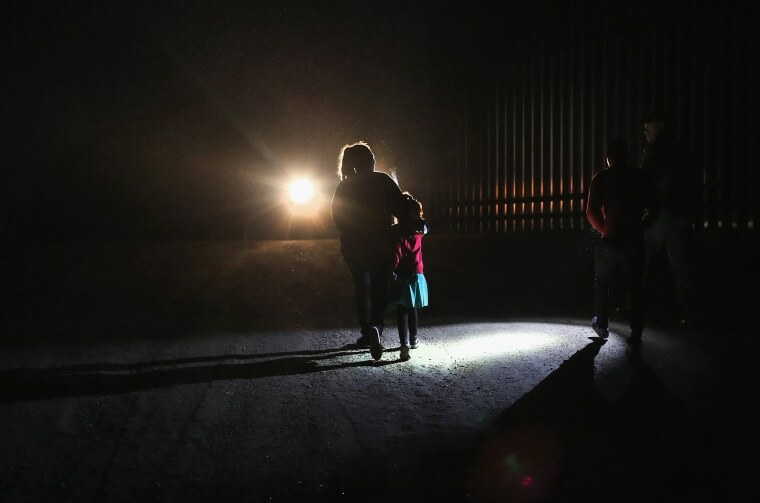 "It would be highly inappropriate and even unsafe to hold children for extended periods in these short-term border facilities because they often lack the adequate medical and nutritional resources for these young people," said Greg Chen, director of government relations for the American Immigration Lawyers Association. "It would place these children at risk of harm if they are housed with adults without the proper privacy that children should have." A spokesman for DHS did not respond to a request for comment. The overstays at border stations are a result of a backlog at U.S. Health and Human Services (HHS), the agency responsible for sheltering migrant children longer term and matching them with relatives or foster parents in the U.S. The agency's Administration for Children and Families has 11,200 unaccompanied children in its care and takes 45 days on average to place a child with a sponsor, according to a spokesperson. HHS officials will soon tour military installations near the border in Texas as they search for more space to house children while they wait for placement. The officials will tour Dyess Air Force Base, Goodfellow Air Force Base, and Fort Bliss, the spokesperson said. "HHS will make the determination if they will use any of the three sites for UAC (unaccompanied alien children) operations," the spokesperson said. A Defense Department spokesperson said HHS was the lead agency and referred NBC News to HHS. Military bases have been used to house migrant children in the past, but only as a last resort, according to an Obama administration official. In May, the Trump administration began enforcing a "zero tolerance" policy on the southern border, prosecuting any adult who entered the country illegally in order to crack down on the surge in the number of immigrants crossing the border. Parents traveling with children are separated from their kids while they face legal proceedings. Two U.S. officials said HHS was not given proper warning of the new policy and was caught unprepared at the influx of children. "What's happening now is a broad indication of a total lack of planning or forethought for the policy they enacted," said Peter Boogaard, a former DHS and White House official in the Obama administration who is now a spokesman for the immigration reform group FWD.us. "They didn't think this through at all — what it would mean for kids, for their parents and for the operational challenges." The Trump administration recently started requiring HHS to fingerprint people claiming to be parents of unaccompanied children, a move the previous administration said would delay children from being reunited with their families and scare undocumented parents away from coming forward.